I spent a nice couple of days in Luxembourg with my friends and their new baby. It was strange to meet their child, of whom there had been no evidence when I passed through at the start of my trip but was now the most important thing in my friends’s lives. Life had definitely moved on while I had been riding round! It was also nice to catch up with a few more of the people I had known when I worked in Luxembourg about five years ago. All too soon it was time to leave and begin the last leg of my journey. 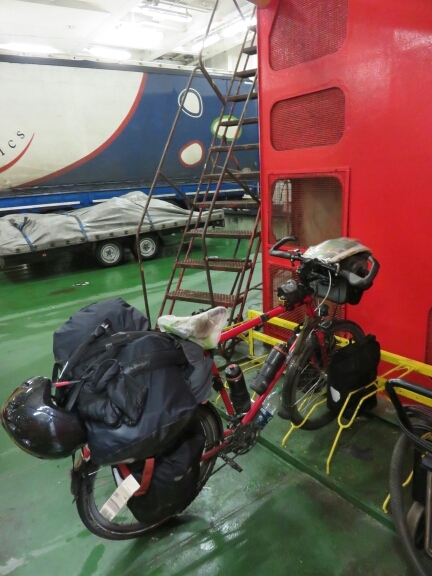 I was planning on riding the 420km from Luxembourg to Calais in four days and then taking the ferry over at the most convenient time after I arrived. This leg was going to be strange as I would be riding in reverse the same route I’d taken 18 months ago almost completely. Though I had ridden from Luxembourg to Geneva previously I had taken a different route that went through Germany. On the way out I had taken the direct route to Luxembourg and I would be taking the direct route back. This time I was not planning on following Google slavishly as I had learnt (often the hard way) that this is not always the most efficient way to plan routes by bicycle. The morning I left Luxembourg was fairly nondescript – not very cold, not very bright and thankfully pretty dry. More importantly there wasn’t a great deal of wind so I was able to make pretty good time. 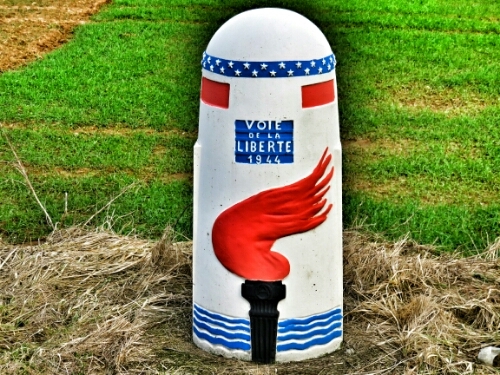 I was riding, at the start, down the Liberty Road, which commemorated the route that the Allies took when they liberated France, Luxembourg and Belgium during WWII. Of course 70 years later this marked road was the only obvious evidence of the world changing conflict that had torn the land I was riding through apart. Riding through, it was strange to see places that I recognised from previously, even if I wasn’t going exactly the route I’d followed 18 months ago, I’d occasionally intersect with a village I remembered. I was taking a much more direct route this time and following the secondary roads rather than the cycle paths. This was because I was a bit nervous of taking cycle paths in winter as they were sometimes impassable with mud. Riding through Luxembourg I soon entered Belgium and passed through Arlon, a nearby Roman city. The next place of any interest was the European Space Agency which I had passed also 18 months ago. It looked a lot less impressive than the Kennedy Space Centre, which I had visited when I was in Florida. I made very good time that day and realised that if I kept it up I would be able to reach Calais in three rather than four days. So I made sure I pushed on a bit and passed the place that I had spent the night when taking this route out of Europe, which was Givet which is in a small piece of France that sticks up into Belgium. 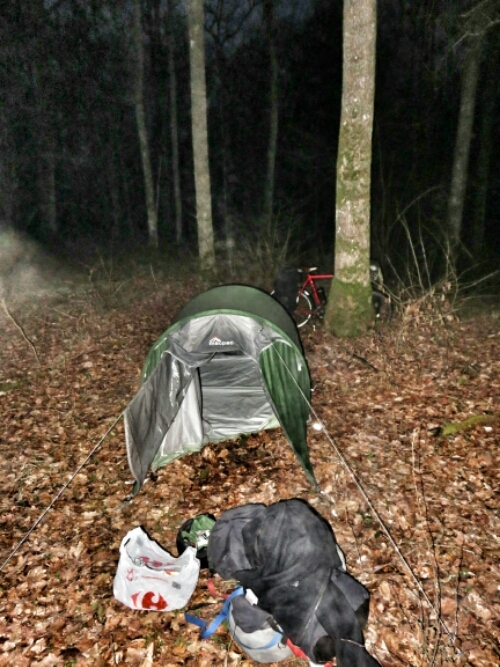 So that day I ended up riding from Luxembourg into Belgium then into France and finally back in to Belgium where I began to look for somewhere to camp. As I began to look for somewhere to camp I was riding through forest and unfortunately I was seeing signs saying it was private property. It was also hard to get off the road as there was a ditch running beside the route on both sides. Eventually, after I hadn’t seen a private property sign for a while I spotted a passable area that would let me across the ditch and wheeled my bike down into the woods and found a bit of ground without too many roots or small bushes and got my tent set up. It was a fine night of camping with a beautiful clear sky and some beautiful stars to see in the night. Unfortunately in the morning it was a bit foggy which meant there were crazy amounts of condensation on my tent which I knew I would have to deal with later or have a damp tent in the evening. Riding back onto the road I had a scary few kilometres on the N40 as visibility wasn’t great, there was a lot of traffic and Belgian motorists are mental. Everyone was whizzing past me at way past the speed limit on this narrow road with no shoulder far too close for comfort. Thankfully the road eventually finished and from the city of Mons I started riding on cycle paths alongside the canals. This was nice and quiet but was sometimes annoying as if you were on the wrong side of the canal you could end up taking the wrong route as there was more than one waterway and they sometimes intersected. I seemed to remember this happening the last time I passed through as well. Still the canals were pretty direct, were certainly flat and were fairly easy to follow. I was making good time again in spite of a fairly strong crosswind. I’d got the bit between the teeth now and was determined to reach the UK the next day. Then in quiet rural Belgium I found myself set upon by rabid wild beasts! Two huge geese were suddenly running at me from the path I wanted to take with their necks extended. They were hissing menacingly and charging. I had to walk my bike back frantically in order to get out of their range. Luckily when I backed off a bit they stopped attacking. Unluckily they started running at me again every time I tried to take the path they were guarding. As I’d heard that geese could do some damage I was in no mood for attempting to go through them. So I searched for a route around and thankfully I saw another path that seemed to go roughly in the direction I wanted and when I took this it quickly rejoined me with where I wanted to be. I hadn’t been expecting to be attacked by animals in Belgium that is for sure. 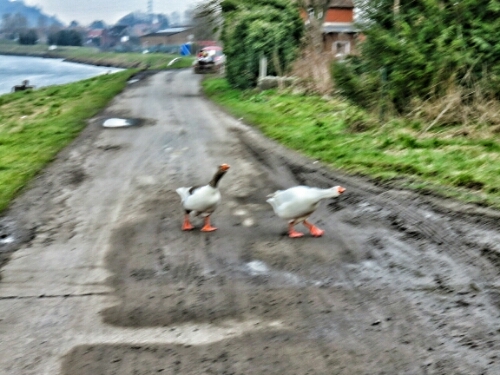 Once I was past the geese I continued on, hammering down the canals and making excellent time. I continued riding quite a while after it got dark to make sure I made the distance and also because I reached a very built up area as it got dark and it got difficult to find somewhere to pitch my tent. This was coupled with one side being blocked by the canal meaning I was getting quite worried about not being able to find anywhere. Finally I saw a spot that looked a possibility. It was very narrow, I was up against a wall on one side and on the other a narrow piece of grass sloping up to the canal path and then the canal. On the other side of the wall was a town and so this was probably one of the more exposed spots I had camped in Europe. Luckily it was winter and no one was out and about for a walk once night had fallen so I spent the night undisturbed. The next day I woke up to rain but thankfully this had abated by the time I was ready to leave. Which was pretty early. I was determined to make it to Calais and across the Channel that day. I would need that determination because as soon as I passed out of the city of Kortrijk the wind and the rain began and I settled into a miserable day battling winds while feeling damp. The rain was thankfully more showery to start but as I passed through Ypres and the Menin Gate for the second time on the trip it began in earnest. I was now going to have to contend with that dampness all the way to Calais. Happily I did reach the ferry terminal before darkness fell but the rain was really heavy at this point and all I wanted to do was get home, or at least back to England. I’m not sure why as it was almost certainly going to be raining in England as well. Probably harder. Thankfully I was able to pick up a ticket for a ferry at 17:55 and I headed off to board. Unfortunately cyclists have to board like cars so I had to wait in the queue in the rain for the immigration and ticket checks. I was not having the best of days. Then I was finally on the ferry and I was a short sea journey away from my homeland. The first time I took the ferry over in August 2013 I took all my bags off and carried them up to the passenger decks with me. I realised that this was probably unnecessary when I noticed none of the other cyclists were doing the same. This time I was the only cyclist and I left my bags attached. On the ship I felt quite strange. This was the first time I had been so surrounded by British people since Baku well over a year ago where I had spent some time with the expat community there. It was a very odd feeling I could feel the tendrils of society pulling at me and drawing me back in to its embrace. Just looking at the people on the boat I was able to tell where most people fitted in to England. Even in Europe and the USA it had not been as easy for me to tell where I and everyone else fitted in, also I had known I was just passing through. It also made me realise how out of the normal run of things I had been while travelling, I felt that I truly had journeyed in my own separate category. Now as I stood upon this ship predominantly peopled with other Brits I could feel that it would soon be over and I would no longer be different. I also had some food in the ships canteen which was sadly clearly run by British people. I had forgotten how bad English food can be. At least it was high in calories. As the ferry pulled in it was still raining and it was now full dark and I was in the middle of a town. I had about as much appetite for going to find somewhere to camp as I had for eating mud. So I searched for a cheap hotel/B&B and managed to find one not far from the ferry port. I rolled up to this and had fun getting the bike in the shed and my bags up the very narrow windy stairs to the third floor. It was a nice hotel though: very clean, warm and with a complimentary biscuit. I hope it was complimentary anyway. The next day I even got a hearty breakfast and I felt ready for the 120km that would get me to Bromley and my last warmshowers host of the trip. I was hoping I would have an easy day of it. I did not. The wind seemed determined to make my last days touring difficult and unpleasant. This coupled with the rolling hills of Kent meant I had a tough day of it. Initially I was quite chirpy as I started the day warm from the hotel and within the town there was no wind. This of course changed not long after I left Dover and as persistent showers began for another day, I just got my head down and kept on going. 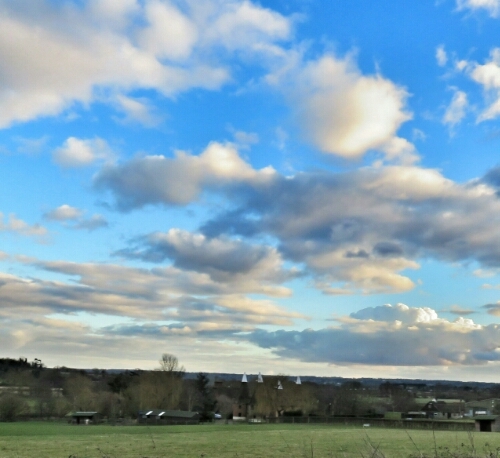 The afternoon was more pleasant as the rain stopped and I began riding on some pretty little B and local roads in the Kent Downs. Sadly for every down there first had to be an up and by the time I reached Bromley I was pretty tuckered out. Luckily my warmshowers.org host that night: André was very hospitable and made sure I was comfortable and well rested for the short ride the next day into London. I’d never really been to Bromley before so it didn’t feel so strange to be there. 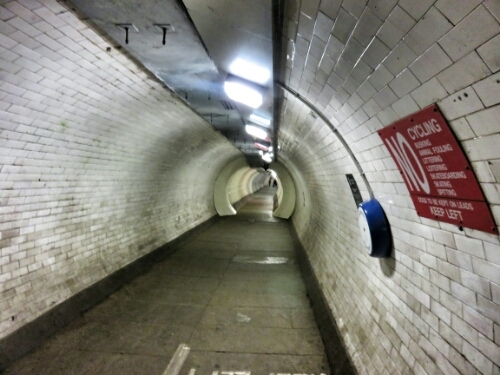 As I rode further north into London it began to feel a bit weird. I had lived in and around this area for a number of years and as I passed through Lewisham into Greenwich and finally under the Thames via the Greenwich footbridge to the Isle of Dogs I reached the place that had been my home for two years 18 months ago. I rode past the house I had lived in in London and it was odd that it didn’t feel stranger thought it was certainly odd. The more I rode the more normal it felt and suddenly I didn’t have to think about riding in a busy capitol city as I was riding a route I had ridden countless times before. I was on the roads I had cycled the most when I used to travel round London on the Barclays Bike public cycle hire scheme. I knew which lane I needed to be in and when the traffic lights would be changing and I didn’t need to even consider which way I was going. This meant I soon reached my cousins in Mile End where I would be spending that evening. This was the first of my family I had seen since I passed through Singapore in March a year ago and it was a nice feeling. 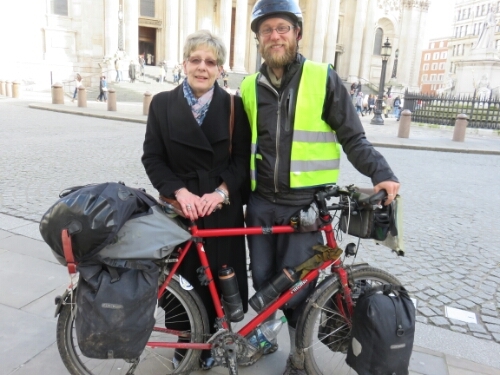 The next day I rode into central London to surprise my mother who works there. 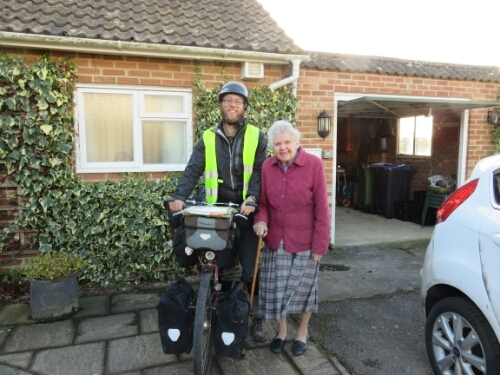 She didn’t think she would be seeing me until the next day at my grandmother’s in Wiltshire where I would finish and she was unaware I was even in London. She almost didn’t recognise me. That night I stayed with my best friend from school on the other side of London in Teddington as I gradually worked myself in to a position where I could reach the point I started in one day. The following morning I woke up and knew that it was to be the last day of my trip. It hadn’t really sunk in completely. Again I didn’t get an easy day of it and I got a full headwind for most of the day I spent outside of towns. I think I chose the right time of the year to head back. If I had tried it in any other season but winter I am not sure I would have been ready to come off the bike. Returning in winter meant that I was missing out on bad winds and cold weather and it was much easier when I finally reached my finish point. I had to grind along roads I had flown down when I was leaving it was far harder to get back to where I started than it had been to leave. It was a similar feeling to when I had ridden into London as I reached places that were more familiar until all of a sudden I didn’t have to think about where I was going and I knew I would be home soon. Riding into my grandmother’s village I knew that this was it. It was over and I felt a temptation to turn aside and to just carry on riding off into England and another adventure. I stopped myself as I knew the world wasn’t going anywhere and there would be other chances for me to explore it. Now it was time to get home and take on board this journey that was now pretty much over. Over apart from the 8% hill my grandmother lived at the top of. we thought to see you back in Simonswald, but you took the straight route to Luxembourg. It was a pleasure to follow you and read of your adventures and thoughts. We hope you will find and manage other journeys maybe a second time visit the black forest. You know its not only forest, there are some mountains…..
Congratulation Adam! 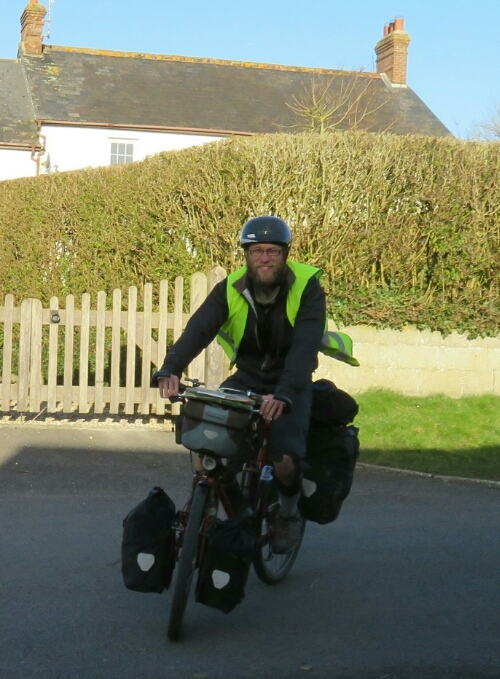 To circle the globe on a bicycle is quite a feat. We are proud of you.